Articles and photos of Tori's wedding popped up in various publications around the world. I waited to report on this because I did not wish to invade her privacy, but since Tori has reportedly discussed her marriage (or at least mentioned it in some interviews,) I felt the time was right to report on it. Below you will find articles on the wedding from various magazines and newspapers worldwide. I also include the 4 photos that were included with an article in the New Weekly magazine in Australia. Tori looked beautiful and the entire wedding looked unique and wonderful. Congratulations Tori! Starting with the May 30th Nottingham, U.K. show, fans could buy a concert program at Tori's concerts. Lianne Macdonald reports on her web page, Collecting Tori, that the tour program was delayed to so that it could include photos from the first few shows of the current UK tour. Lianne says "the programme feautures an introduction from Tori and a piece from Neil Gaiman's "Stardust". There are lots of exclusive photographs in it, including pictures from rehearsals, the recording studio and Tori getting ready for her wedding." You can see scans of some of the photos on the Collecting Tori web site . There was a major article about Tori titled "The big interview - No pain, no gain" in "The Times" (UK) newspaper on April 11, 1998. You can read this article and see some photos from it in my Articles Section. This is the first interview where Tori talks quite a bit about her marriage. She also talks about the new album and her miscarriage. Many thanks to Catherine Taylor for first alerting me to this magazine, and to Mandi Cook and Rusty & Dustin Shelby, for sending me the article and the accompanying photos! "Tori Amos, American Singer Gets Married"
American singer Tori Amos has married her British boyfriend, sound engineer Mark Hawley, in a private ceremony in West Wycombe. Known for her heart-rending, confessional lyrics, Tori has a reputation in the music business for being kooky and once said of herself, "I think I'm certifiable." She opted for a medieval theme for her wedding, arriving at St Lawrence's Church in a traditional white dress and a stunning floor-length silver cape. She was given away by her father Dr Edison Amos, a Methodist preacher from North Carolina. Local Reverend Martin Gillham conducted the ceremony and there was plenty of music during the service, from Bach to Irish pipes, but surprisingly no singing. Two torch-bearers led the bride and groom to a horse-drawn carriage and they were then whisked off to a nearby reception. Tori arrives at the church with her father Dr Edison Amos, a Methodist preacher (far left), for a ceremony in front of 160 people. The happy couple after the service (above). They lead the way as guests follow two monk-like torch-bearers through the darkness (above left). Tori shares a kiss with her new husband Mark as they leave the church by horse-drawn carriage (left). Many thanks to Steven Lawrence, Luke Tilbrook, Jenny Hansen, Stephen J. Pielocik, and Dani for sending me information about this article. The first three photos below were sent to me by Richard Handal, and the last one is courtesy of Steven Lawrence. There was an article on Tori's marriage in an Australian magazine called 'New Weekly' on March 16, 1998. "Wacky Tori Amos, hit singer of 'Cornflake Girl', 'Blue Skies' and 'Silent All These Years', married sound engieer Mark Hawley last month. But the big surprise was that her father, Methodist minister Dr Edison Amos, gave her away. The father and daughter have had a stormy relationship for years - Tori's hatred of religion was a response to his beliefs, and several songs from her album 'Little Earthquakes' condemned her parents. Tori and Mark, both 33, met while working on her new album, 'From The Choirgirl Hotel' (out early in May), which was recorded in a 300-year-old farmhouse in Cornwall, UK. Tori, who grew up in North Carolina, USA, has lived in England for several years. She's currently featured on the soundtrack of the film 'Great Expectations.'" Now this article is horribly wrong in many places. Mark has been Tori's sound engineer since the Under The Pink days, Tori has never condemned her parents, and Tori did not really grow up in North Carolina (She was born there and spent some summers there with her grandparents.) Tori is also 34 years old at the time of this article, not 33. 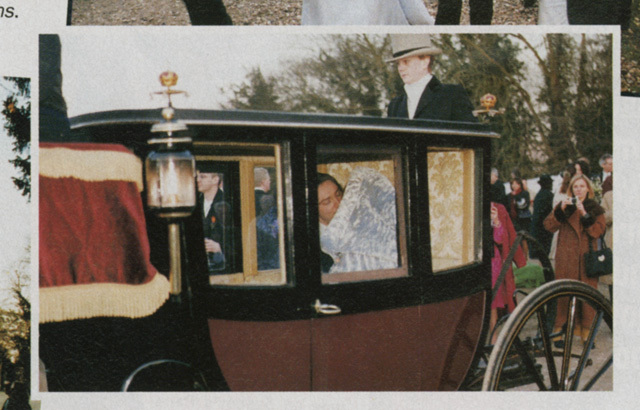 The article includes four pictures of the wedding: one of the church, one of Tori and Mark kissing on a carriage, and two of Tori and Mark walking hand-in-hand outside the church. Click on the thumnails below to see them in more detail. These are different scans of the same photos posted to the Planet Tori web site (a source for Australian Tori news!). Many thanks to Richard Handal for sending me this article. 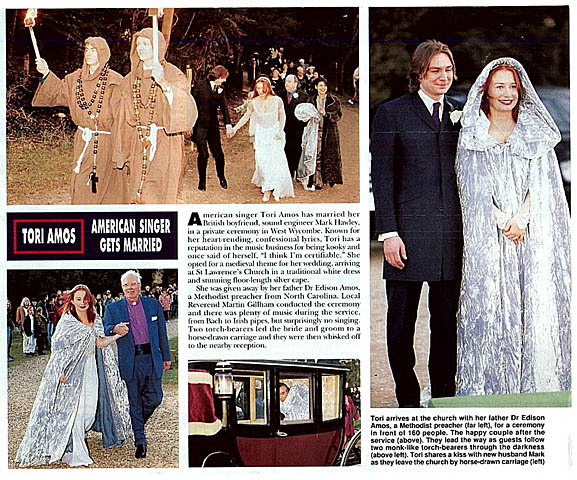 ROCK star Tori Amos turned her wedding into a Gothic fairy-tale when she married in West Wycombe on Sunday. The 34-year-old American singer, who topped the charts with her single Professional Widow in 1996, wore white make-up and a shimmering silver-blue dress with a purple cape for her marriage to sound engineer Mark Hawley, 33, at the Church of St Lawrence. 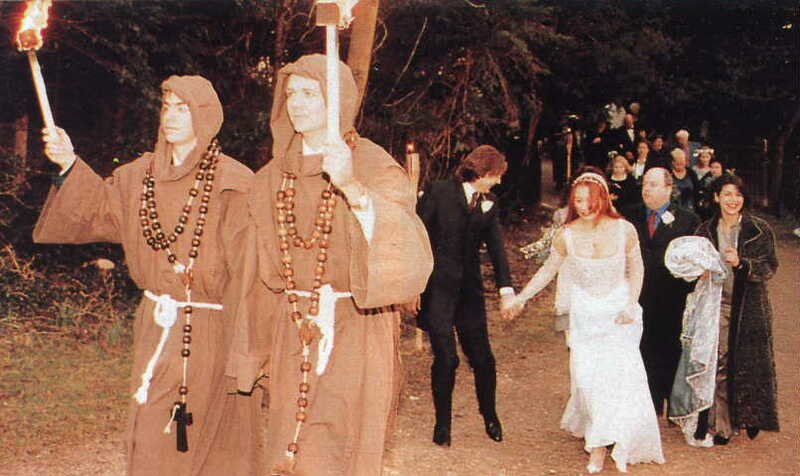 The bride held the wedding in West Wycombe because some of her contacts in the music industry are good friends of Edward Dashwood, who's family owns West Wycombe Estate where the church is situated. St Lawrence's vicar the Rev Martin Gillham married the couple. He said the church was packed with 170 guests, many of whom were dressed in dark velvet suits and capes. Relatives and friends at the reception were served hot punch by waiters dressed in monks' outfits. Mr Gillham said: "Both Tori and Mark did very well. They were both relaxed and confident throughout the service DH and Tori looked radiant and very beautiful. "We had a very good rehearsal the day before and everything went according to plan." The happy couple left the church in a carriage drawn by two jet-black horses. Security guards kept the crowds away from the bride as she walked arm-in-arm with her father Edison Amos, a Methodist minister, into the church. Spectator Hannah Browning, 19, of Oxford Road, West Wycombe, said: "Tori and her husband both looked completely stunning -- especially as they went off in their carriage. She could have chosen a warmer day for it though, I'm absolutely frozen." ....West Wycombe Park was closed for its second traditional Snowdrop Sunday this year because of the splendid wedding, but the popular special day will be repeated this Sunday. 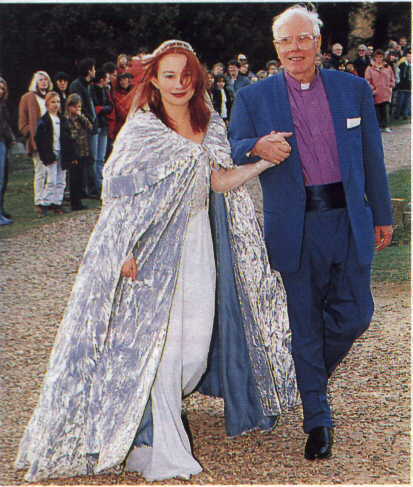 HUNDREDS of onlookers saw rock star Tori Amos arrive for her fairy-tale wedding at the Church of St Lawrence in West Wycombe. The 34-year-old American singer, who topped the charts with her single Professional Widow in 1996, wore a shimmering light blue dress with a purple cape for her marriage to sound engineer Mark Hawley, 33, on Sunday. 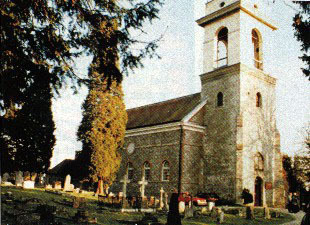 The bride held the ceremony in West Wycombe because some of her contacts in the music industry are good friends of Edward Dashwood, whose family owns West Wycombe Estate where the church is situated. Security guards kept the crowds at bay as the bride walked arm-in-arm with her father Edison Amos, a Methodist minister, into the church for the private service. Local vicar the Rev Martin Gillham conducted the ceremony. He said the church was packed to overflowing with 170 guests. Mr Gillham said: "Both Tori and Mark did very well. They were both relaxed and confident throughout the service and Tori looked radiant and very beautiful. After the service, guests were served hot punch by waiters dressed in monks outfits while the newly-weds posed for photographers. The happy couple left the church in a carriage drawn by two jet-black horses. It took them up a lantern-lit driveway for a reception at the Dashwoods' West Wycombe House. West Wycombe Park was closed for its traditional Snowdrop Sunday celebrations because of the wedding, but the special day will be held this Sunday. All proceeds from the day will be donated to the Church of St Lawrence. Admission is #2 for adults and #1 for children, pensioners and concessions. An essential article has appeared in the March 13, 1998 issue of Rumba magazine in Finland. The article's translated title is "Southern upbringing: Tori Amos' long awaited new album has a hard history" Ears With Feet Katja Laitinen took 3 hours to translate this interview from Finnish to English for us, and I thank her for going to all that trouble! This article is essential because Tori talks a little about her new 1998 album, and she reveals that part of the inspiration behind the new album was a miscarriage she had in late 1996 or early 1997. So it is a sad article in some ways, but it is also inspiring to see how Tori has dealt with this loss. Tori does not talk about her marriage in the interview, but the article does mention it. This article appears in the Wycombe Star newspaper in the U.K. for February 27, 1998. Many thanks to Karen Hagglund for telling me about it and to Mike Snowden for posting it to the rec.music.tori-amos newsgroup. You can also read this article and see the photo that was published with it, at the All The White Horses Web Site . American singer Tori Amos turned her wedding into a fairytale when she married in West Wycombe on Sunday. The 34-year old rock star, who topped the charts with her single "Professional Widow", wore white make-up and a flowing light blue dress with a cape for her marriage to sound engineer Mark Hawley, 33, at the Church of St Lawrence. Reverend Martin Gillham, who married the couple, said the church was packed with 170 guests, many of whom were dressed in dark velvet suits and capes. After the service he said: "Both Tori and Mark did very well. They were both relaxed and confident throughout the service - and Tori looked radiant and very beautiful." Many of the crowd waited outside the church until after the service to catch a glimpse of the newly-weds. After the service, guests were served hot punch by waiters dressed in monks' outfits while the couple posed for photographers. The happy couple left the church in a carriage drawn by to jet black horses. 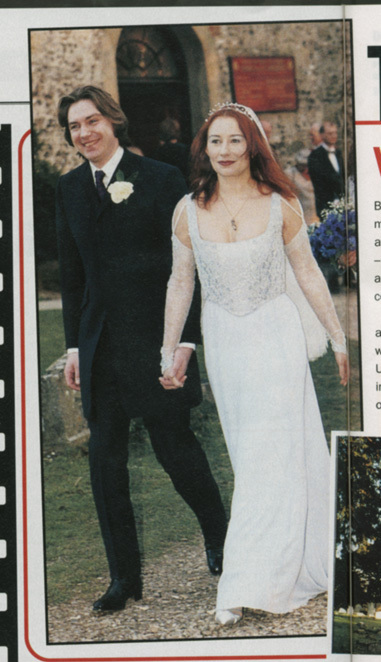 Carl Seville and Paul Beech were the first to tell me that Q Magazine in the April 1998 issue dropped some tidbits about Tori's upcoming 1998 album and also was the first official source to confirm that Tori Amos has married her sound engineer Mark Hawley! Go to my Articles Section to read the April Q Article. The May 1998 issue of Q had a MAJOR Tori article where the issue of her marriage comes up again. Dan Everton sent me a short paragraph on Tori that appeared in a local newspaper in Brisbane, Australia called The Courier Mail on Wednesday 4 March, 1998. It mentions that Tori is now married. Read it in my Articles Section.